As winter transitions into spring for homeowners in Kalamazoo, there are a number of items you should consider to ensure your HVAC system continues to run properly and efficiently. Spring is the perfect time of year for this checklist, considering your furnace is likely done running for the season and you don’t yet require air conditioning. The checklist below will ensure your HVAC system is running efficiently as well as increase its longevity. While this isn’t just a springtime obligation, it should be a part of your spring checklist. Your air filters should be changed regularly according to manufacturer recommendations, or sometimes more frequently if you have pets. Turn on your HVAC unit to ensure it is operating properly and is heating or cooling your home to the temperature set on your thermostat. While the units are running, determine if there are irregular sounds or smells. Your outdoor unit should be cleared of any leaves, branches, dirt or other debris in order to promote unobstructed air flow into your home. Ensure all electrical connections are undamaged and properly connected. As a homeowner, you can visually check the outdoor electric coming from your home. This is a step often missed by homeowners but is important in maintaining an efficient an effective air conditioning system. Before there is a need for air conditioning, check to make sure your refrigerant level is correct. Indoor components such as coils and blower fans should be cleaned as well as lubricated to keep your system running at peak efficiency and to increase the life of your HVAC system. 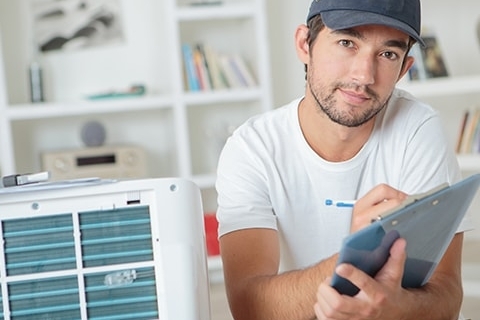 Contact the professionals at JP Heating and Air Conditioning in Kalamazoo if you have any questions or need an inspection, and be sure to ask about the maintenance agreement we have for our customers!